The blue dots are forecasting from the input data without knowing what kind of function it represents. Input can be any time series of multiple or complex applications, with flexibility over chosen time interval. The method will re-present numerical data in a way unique to each set. 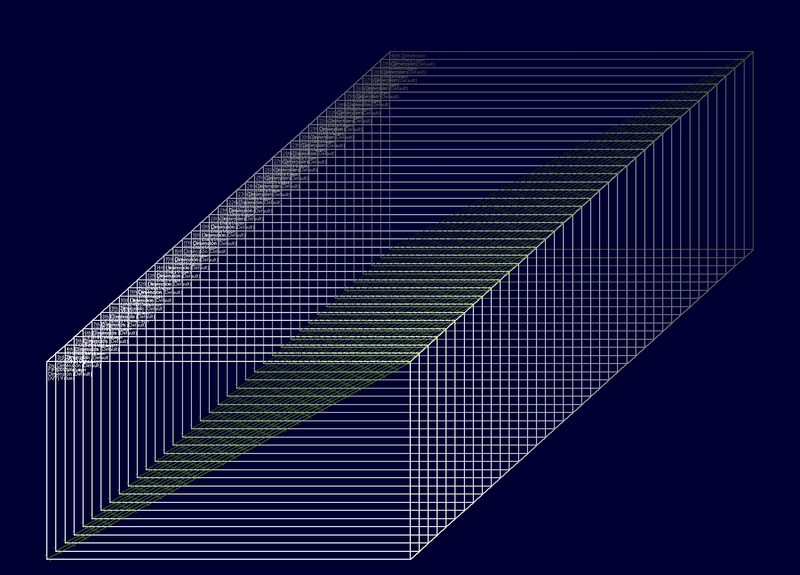 This screenshot shows 40 dimensions or vertical layers. The data points are straight lines to illustrate ‘visual 3D’. This visualization of CO2 output of 209 countries is made from raw data, before menu options allow for fine tuning the visual analysis. As data experts add their perception, interpretation and expertise, the system can feedback a new kind of refined intelligence. 4. Seeing what was previously invisible and to measure what was previously immeasurable. 5. Combining data from sensors: in production, quality analysis, research or anywhere else. “Corporate Intelligence portals” would combine the experience of staff for strategic and executive decision making, while staff can participate in refining the process of automation and optimisation at their respective user levels. It humbles my N=929 validation study of ability, behaviour and capability assessments that I thought was ‘Big Data’.